Eat a Slice of King Cake, Toast to Mardi Gras! Mardi Gras or literally translated, Fat Tuesday is today! Break out the beads, make a toast, and celebrate the last day before Lent. Tradition has it that the holiday is called Fat Tuesday because it’s the last day to feast on rich, fatty foods before fasting for Lent begins. Have you ever eaten a King Cake? 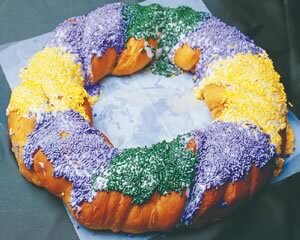 Popular in Europe and New Orleans, this ring-shaped cake is served from the Christmas season until Mardi Gras. In New Orleans, it’s likely to be guzzled down at Mardi Gras office parties, city celebrations, and gatherings with family and friends. King Cake has hints of cinnamon and nutmeg and if you like, you can also add raisins and nuts. Drizzled over the cake is a silky glaze that is sprinkled with festive sugar in the Mardi Gras colors: purple, gold, and green. The fun part about this dessert is that the cake is baked with a small plastic baby inside. People have also substituted the plastic baby for a bean or piece of candy. The person that gets the slice with the baby becomes king for the day and gets to host next year’s King Cake party.